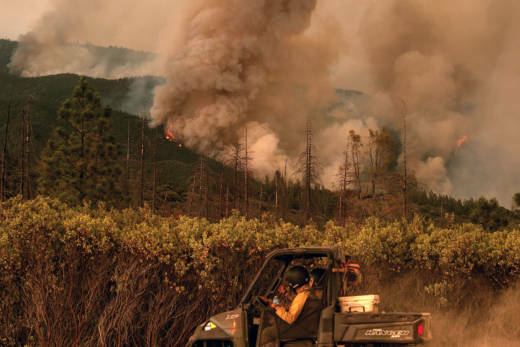 A Cal Fire bulldozer operator killed in mid-July during the first hours of the Ferguson Fire near Yosemite was working alone on a treacherous jeep trail when his 42,000-pound machine crashed down a mountainside. A Cal Fire report on the death of Braden Varney, 36, also says that fire commanders on the scene of the Ferguson Fire had been unable to communicate with him for more than four hours before he was discovered dead in the wreckage of his machine. The report, which KQED obtained under a California Public Records Act request, suggests incident commanders and the bulldozer crew were lax in following basic safety protocols prior to the fatal incident early the morning of July 14. Although the report does not assign responsibility for Varney’s death, it lists more than a dozen “safety issues for review” and “incidental issues/lessons learned” in the wake of the incident. The list of issues suggests that commanders didn’t have a clear plan for Varney to execute and that both the bulldozer crew and commanders failed to maintain adequate communications as Varney made the decision to negotiate the narrow, hazardous jeep trail. Agency spokesman Scott McLean said in an email Tuesday that "all of the incidents" relating to Varney's death are still under investigation. The Cal Fire document, which the agency calls a Green Sheet, details a sequence of events that began the evening of July 13 when the Ferguson Fire was discovered and Varney, a 10-year veteran with the agency, was among the first firefighters to arrive on the scene. Varney and his swamper -- a certified heavy-equipment supervisor acting as a helper and lookout -- unloaded the dozer from a transport in a remote area of Sierra National Forest about 10 p.m. on the night of July 13. The report says Varney was unable to talk directly with fire commanders as he maneuvered his machine down a backcountry route known as Hites Cove Trail toward a planned rendezvous with bulldozers working on the other side of the South Fork of the Merced River. Instead, he relied on his swamper to relay messages to and from incident commanders via radio. At 3 a.m., after traveling about 2 miles from the transport vehicle, Varney sent the swamper back to get a replacement for a hydraulic line that had developed a minor leak. The Green Sheet says that the swamper's last contact with Varney was at 4:30 a.m., when the two talked by radio about where to find the keys needed to retrieve the spare part. The swamper then left the area to pick up the bulldozer's relief operator. Repeated attempts after that to raise Varney by radio failed. Cal Fire personnel knew nothing more about his whereabouts until 8:47 a.m., when a firefighting pilot who had been asked to look for Varney spotted his bulldozer. The swamper reached the scene shortly after 9 a.m., worked his way down to the dozer and found Varney trapped in the machine, dead. Varney, whom Mariposa County coroner's officials say suffered crush injuries to the neck and chest, was not extricated from the dozer until two days later. Cal Fire’s subsequent investigation found that Varney veered off the trail three times -- the Green Sheet calls these “slips” and “near misses” -- in less than 600 feet before his fatal plunge. 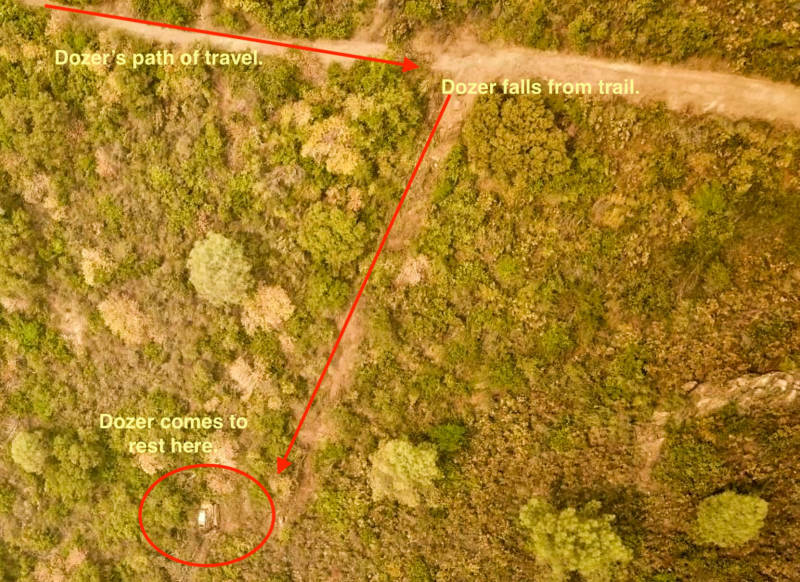 "The first near miss revealed Dozer 1 (Varney’s bulldozer) had completely left the trail, before climbing back up and continuing down the trail," the report says. The report offers a long list of "safety issues for review" and "lessons learned" in the wake of the incident. Risk analysis must be conducted and has to be considered prior to implementing a plan. Risks taken on the fireline must be commensurate with goals and objectives. Actions taken on the fireline must have strategic or tactical value. Firefighters should recognize the special hazards of working in steep terrain and diverse soil types specific to the incident they are working. Fireline supervisors need to initiate and maintain communications while maintaining accountability of their assigned resources. Working alone on the fireline should be an anomaly, not the rule. Give clear instructions to personnel and ensure they are understood. Post lookouts when there is possible danger. Maintain prompt communications with your forces, your supervisor and adjoining forces. Maintain control of your crew at all times. Working in country you have not seen in daylight. No communications link with crew members or supervisor. Instructions and/or assignments are not clear. Steep fill slopes can fail under the weight of equipment. The first three near misses were indicators of the potential for roadway failure. The LCES concept (lookout, communications, escape routes) is not limited to fire suppression. LCES can be applicable during high-risk activities and should be appropriately utilized. Lookouts must be empowered to cease operations when unsafe activities are observed to share the observations, express concerns with the resource(s), and mitigate as appropriate. Modern equipment can exceed the limits of safe fire ground operations and may cause personnel to push too far. Use the IRPG (Incident Response Pocket Guide) risk management process to mitigate hazards. Establish decision points to disengage and re-engage the incident and make them known. Ensure effective communications are in place before beginning any assignment. Varney is one of two firefighters killed in the Ferguson Fire and among four firefighters who lost their lives battling large blazes in California in July. Brian Hughes, a member of the Arrowheads Hotshots Interagency unit, died Sunday morning while conducting a tactical firing operation on the east side of the Ferguson blaze. Last Thursday, 81-year-old Don Ray Smith, a contract bulldozer operator, was killed in Redding helping firefighters battle the Carr Fire. The following day, Redding firefighter Jeremy Stoke also died.